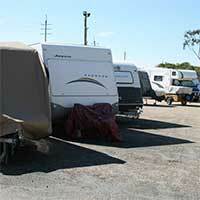 For Caravan Storage Ormeau - contact Oasis. Our brand new centre is just off exit 41 of the M1 Motorway, convenient for all vehicles. Furthermore, this allows you and your family to pack up quickly and be ready to go away any time of the year! While caravans are great fun, let’s face it – storing them can be a nightmare. They are big and bulky and when stored on driveways or lawns, can be an eyesore - especially for the neighbours! We offer first class security for vehicles and other household items, with new CCTV camera surveillance 24/7, and a fully fenced area. You can rest easy knowing your possessions are safe. Also, you can gain access to your items 7 days a week using your personal PIN Code, so, we put you in control! The driveways are nice and wide, making it easy to drive right up to your storage area. At Oasis we focus on customer satisfaction, and with no long term contracts to bother you, (minimum 1 month), we make renting easy! First rate caravan storage right here in Ormeau - local residents can't believe it! If you're not going to be using your caravan or any other vehicle for a while, and you just want to find a safe place to park it, contact Oasis Storage. Affordable with a service you can count on, great value for your money. De-clutter your home - use our self storage for all the other stuff! It's not just about caravans, trailers, motorhomes and cars, what about household items? Is your garage or spare room bursting at the edges with things you don't use every day? Oasis Ticks All The Boxes! Finally, a storage facility focussed on providing a first class service to suit all budgets. Call us today or pop in for a chat and more info - We'll take care of all your personal items.